The National Archives Labs will be closing shortly. You can still access archived versions of the content at the UK Government Web Archive. The Valuation Office map finder will still be available. We have updated our variety of datasets, which are based on records and information held by The National Archives, and encourage web developers to experiment with new applications, online tools and ways of visualising data. We will continue to add more datasets to this post, so do revisit Labs for new data to use. We will also update the data currently available, so please check the date in which the data has been added for the latest version. All the information about the data is below. Do let us know what you’ve done with the data by posting a comment on Labs - it would be great to hear from you. The data we have made available through Labs is licensed under the Open Government Licence. Catalogue details of the case papers from series MH 47 of individuals appealing against conscription to the Middlesex Appeal Tribunal, giving names, addresses and occupations of appellants, as well as grounds for appeal. It would support georeferencing and statistical analysis of appellants’ occupations and grounds of appeal. Right-click to save this dataset to your computer. The National Register of Archives (NRA) is a central point for the collection and dissemination of information about the nature and location of manuscripts relating to British history. It currently consists of over 44,000 unpublished lists and catalogues that describe archival holdings in the UK and overseas. This dataset contains details of all the collections in the NRA relating to women. It can be combined with data from ARCHON to allow georeferencing. The individuals listed in this dataset form part of the NNAF (National Name Authority File). List of over 4800 government films accessioned by The National Archives and held as public records in the BFI’s National Film Archive including wartime and documentary classics such as Night Mail and Listen to Britain and Colonial films such as Amenu’s Child and Morning on Mount Kenya. The National Archives holds paper files on the making of many of these films in the INF class. Gives details of files received by The National Archives over the past decade including department of origin, year of arrival, catalogue reference and physical width on our shelves. This dataset would support visualisation. Postal and web addresses for around 2400 UK record repositories listed in the National Register of Archives (NRA). This dataset would support georeferencing. A list of around 700 archives from around the world that hold collections noted under the indexes of the National Register of Archives (NRA). The dataset gives postal and web addresses for these repositories and would support georeferencing. The National Digital Archive of Datasets is accessible through Documents Online. It contains hundreds of datasets from over 30 government departments from crime and judicial statistics to listed buildings and bat population data. Learn more and download datasets from The National Archives’ website. The database provides information on the existence, location and administration of the records of UK hospitals. There are currently over 2,800 entries, which have been compiled by the Wellcome Library for the History and Understanding of Medicine who continue to work to develop and improve the database. This data is released under a Creative Commons non-commercial licence by kind permission of the Wellcome Library. See the live database on The National Archives’ website. Catalogue details of a selection of letters from the 12th to the 16th centuries giving details of writers, recipients and the subject of their correspondence. This files series contains official correspondence from the Pope (some with attached metal ‘bullae’) between the 1130s and the break with Rome 400 years later. This catalogue data might permit relatively sophisticated analysis of the Pope’s wide interests in British politics and ecclesiastical life. See a visualisation based on this dataset. Covers details of Equity cases from the court of Chancery: manorial, domestic and trading disputes, disputes over land purchase, apprenticeship agreements and much more. This dataset gives names, places and the subject of the litigation. Extremely detailed, name rich record descriptions of a wide range of correspondence between central government and selected regional Victorian Poor Law Unions across England and Wales. You will find letters, memos, reports and accounts alongside details of individual paupers many with stories of extreme hardship. This dataset might support relatively sophisticated modelling of disease and mortality statistics amongst many other applications. This dataset lists places mentioned in William the Conqueror’s Domesday Book. Other data shown includes current place names, latitude/longitude, and an ID number which is keyed against our placename gazetteer (The National Archives Places), supplied separately below. NOTE: Place ID in this dataset matches Place ID in The National Archives Places. Contained in this spreadsheet are details of petitions to the Crown and other state officials from across the medieval period. The Catalogue entries list the petitioners and the nature of their request as well as related place names, addressees and other data. (This information is split across two columns and will need to be recombined). This spreadsheet gives the numbers of pieces and documents for every series in The National Archives’ Catalogue – from A 1 to ZWEB 7. 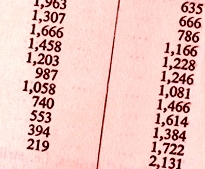 The related pivot table (943kb) gives the numbers of pieces in each class. The data has the potential to allow visualisations showing the relative scale of our holdings across government. This file series contains records from the Director of Public Prosecutions. This dataset is extracted from the most fully catalogued portion of the series and gives details of defendants, offences committed and some geographical information. NOTE: The naming of a defendant within this dataset does not imply guilt. These tweets are from our @ukwarcabinet twitter feed, which used British War Cabinet papers to follow the progress of the Second World War in near real time. The spreadsheet contains tweets covering events from 1 January 1940 to 15 August 1945 (with a gap from October 1942 to September 1943). Almost every tweet links to an original Cabinet paper via Discovery. COPY 1 is a copyright register which contains examples of Victorian art and design sent to Stationer’s Hall in London by their creators, as proof of their ownership of the work. This dataset is extracted from the best catalogued portion of COPY 1. Each entry gives a description of a photograph, the photographer’s name and their address. This dataset would support georeferencing. Every item in Discovery is assigned one of around 120 categories according to a series of rules described in this document. These categories aid searching and filtering of search results. A broadly representative selection of central government social media presences covering Flickr, Facebook, Twitter and YouTube. This data represents a small subset of the channels which The National Archives is required to archive on behalf of central government. We estimate this will reach 200 for this year. Traffic statistics for the UK Government Web Archive first became available to us in January 2009. Since that time we’ve seen a massive increase in the number of ‘hits’ received and some interesting trends have emerged. Please note that due to the complexities of recording ‘hits’ to such a large collection the figures may not be entirely accurate however they are broadly reliable and the trends are accurately reflected. The statistics are divided into two categories ‘Normal’ (which counts ‘hits’ resulting from users browsing to the web archive through search engines or our pages on the TNA website) and ‘Recent’ (which counts the number of ‘hits’ resulting from users being redirected into the web archive through an automated redirection component (see http://nationalarchives.gov.uk/information-management/policies/web-continuity.htm). A number of the graphics above are missing because it appears that the URL is pointing to a development server, which is likely not accessible by the general public. Thanks very much for reporting this, everything should now be fully accessible. What licenses are the datasets mentioned above available for use under? I can think of many uses for the data, but without a license which permits reuse I’m a bit stuck. Thanks for your interest Richard. The data we have made available through Labs is licensed under the Open Government Licence. sorry about that. keep up the good work! Hi Chris, we need a bit more information in order to answer your question – which dataset are you referring to please? Apropos my previous comment. The data quoted is from TNAplaces.csv. It is far from the most serious instance. From memory the example quoted a range of 12 identifiers with identical data. Would it be possible to have more granular information down to the series level?